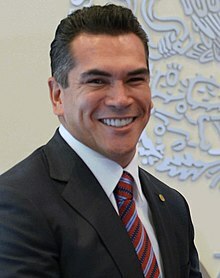 Rafael Alejandro Moreno Cárdenas (born 25 April 1975) is a Mexican politician current Governor of Campeche, who is affiliated with the Institutional Revolutionary Party (PRI). As of 2013[update] he served as Deputy of both the LIX and LXII Legislatures of the Mexican Congress representing Campeche. He also served as Senator during the LX and LXI. ^ "Perfil del legislador". Legislative Information System. Retrieved 3 December 2013.